Kitchen and Residential Design: Want to be a hero every morning? This is the new Spider shower head from Italian manufacturer Visentin. 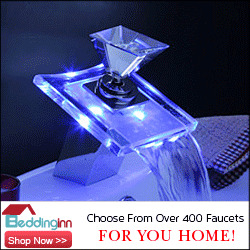 It can be ceiling or wall mounted and each the the mini shower heads can be positioned independently. 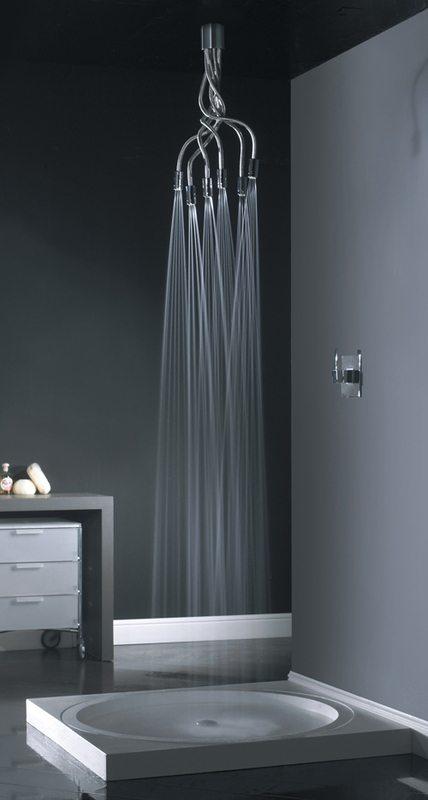 Visentin is not the first manufacturer to play around with this shower configuration. I find them to be interesting but not for the reasons Visentin wants me to. When I see these shower heads, I see the head of Medusa. Medusa was a Gorgon, one of three terrifying sisters who wreaked havoc across the the landscape of classical antiquity. 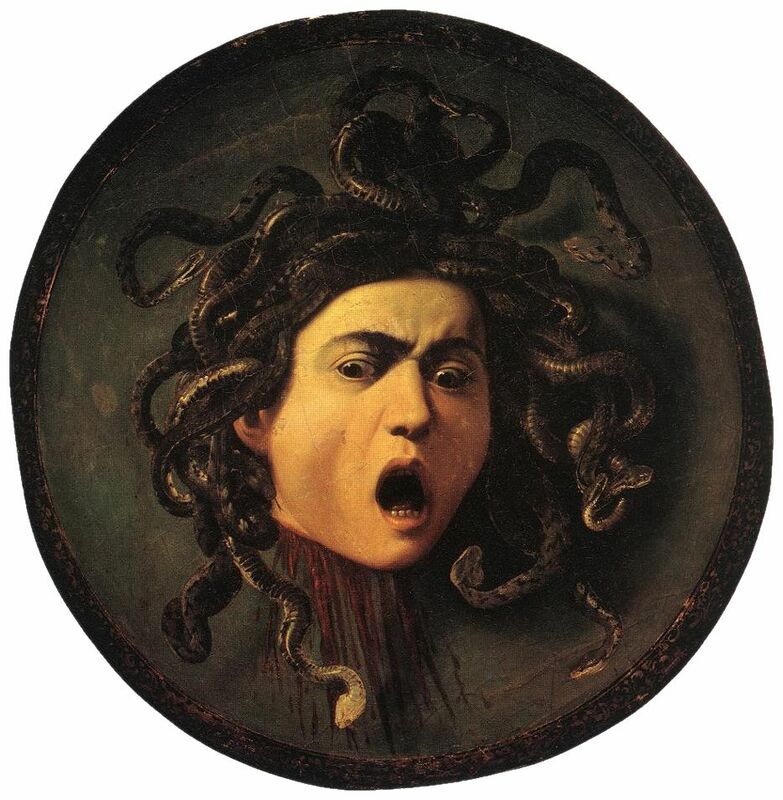 Medusa started out as a ravishing beauty and a priestess in Athena's temple. She had a lot of luck with gentlemen callers but pressed her luck too far by bedding down Poseidon in the temple itself. This enraged Athena (who wouldn't be enraged?) so Athena turned Medusa into a hag and transformed her glorious hair to snakes. Enter Perseus. 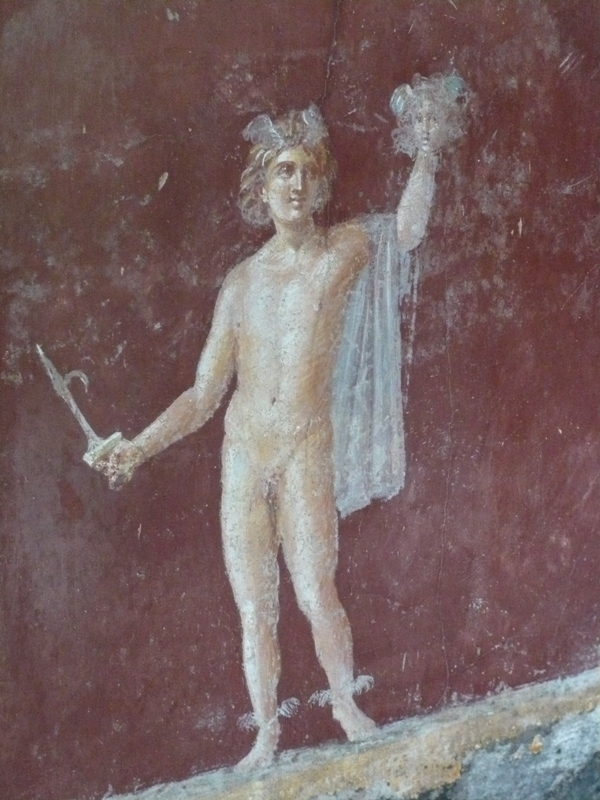 Perseus was a hero-in-the-making and his mother was about to be wed against her wishes to King Polydectes of Seriphos. 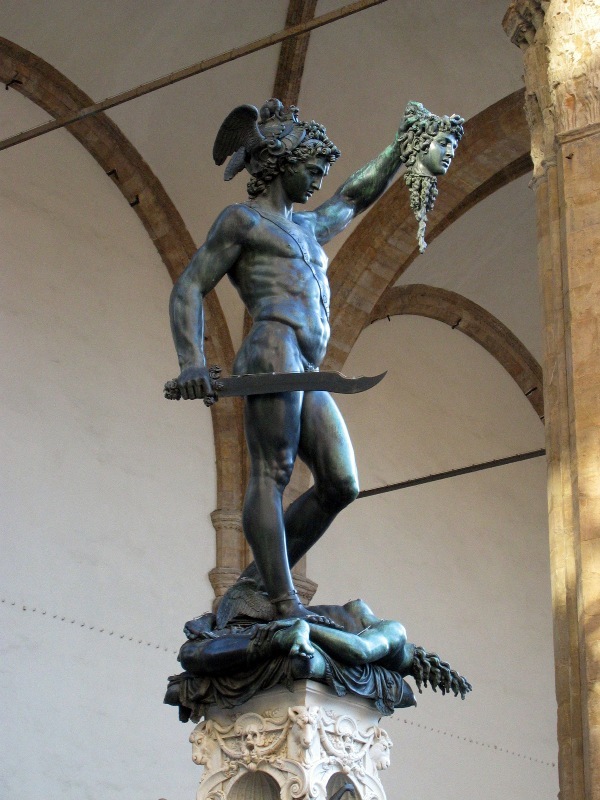 Polydectes send Perseus to go retrieve Medusa's head because he wanted to give it as a gift. 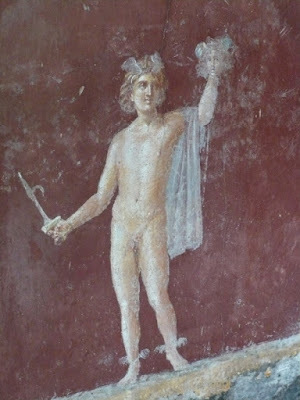 Perseus enlisted the help of Anthena and Hermes who gave him a Cap of Invisibility, a sword, a mirrored shield and a pair of winged sandals; and off to work he went. By using the cap of invisibility and the mirrored shield, Perseus got close enough to Medusa to behead her without ever having to look at her. Perseus holding the head of Medusa, a photo I took on an archeological dig in Castellamare della Stabia in southern Italy. Once he had the head, Perseus flew back to Seriphos, showed the head to Polydectes and turned him to stone, thus saving his mother from a marriage she didn't want to go through with. He later gave the head to Athena who attached it to her shield and ended up with the ultimate revenge on the fornicating Medusa. Perseus with the Head of Medusa, Benvenuto Cellini, 1554. Perseus looks poised to take a shower in this statue or am I just imagining things? The moral of the story? Take your pick. Never fool around with a god in another god's temple, no matter how good he looks or the kinds of promises he makes. He's going to get away Scot free and you're going to have to deal with some kind of divine wrath. Another good one to remember is to be careful of sending the son of the woman you want to marry against her will on a heroic labor. Overall, just like any classical myth, the overriding lesson is always "behave yourself." That's a lot of work to go through just to take a shower in the morning. Heaven knows I love Classical Mythology, but sometimes I want to just start my day with a conventional shower that doesn't inspire me to think so much. What about you? Do these many-serpent-headed showers move you in any particular direction? Would you take a shower with a Gorgon? While Perseus is one of my favourite characters from classical myth, the shower head would make *me* start singing "Octopus's Garden". Hah! I think I'd be afraid to look at it directly. Ok, another disturbing thing: The shower head is called a the Spider when it clearly only has six spigots. Shouldn't it be called the Insect? or the Bug? I have a feeling that Spider may be a bad translation. Let me check their website in Italian. 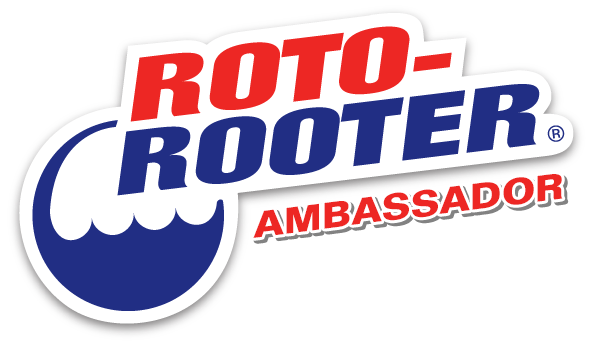 I just checked the site. In Italian, it reads "Soffione doccia Spider a soffitto o parete." Roughly translated, that's "The Spider shower for wall or ceiling mounts." So much for my bad translation theory. EEEK --just the idea of a spider in my shower makes my skin crawl. Even if it doesn't have the right number of legs and is made of metal, the name would always be in the back of mind. Not to mention, it's jus ugly. I thought it looked more like a trident... but that's Poseidon... and only 3 legs. Nonetheless, I'm happy to keep mythology of any sort out of my shower. Nice post!